Along the south wall of our factory on Valencia Street, there are six, spinning steel melangers. 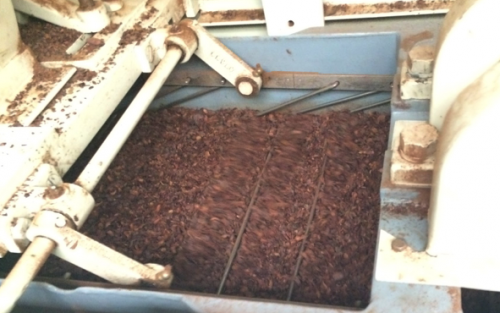 This is where the cocoa nibs turn into cocoa liquor, and where the liquor and sugar are refined and conched until they have reached the perfect consistency and flavor to become a chocolate bar. The melangers themselves are actually modified spice grinders from India, comprised of two spinning granite wheels and a granite base. They spin 24 hours a day, crushing nibs and sugar together and oxidizing the mixture which helps release volatile aromatics. 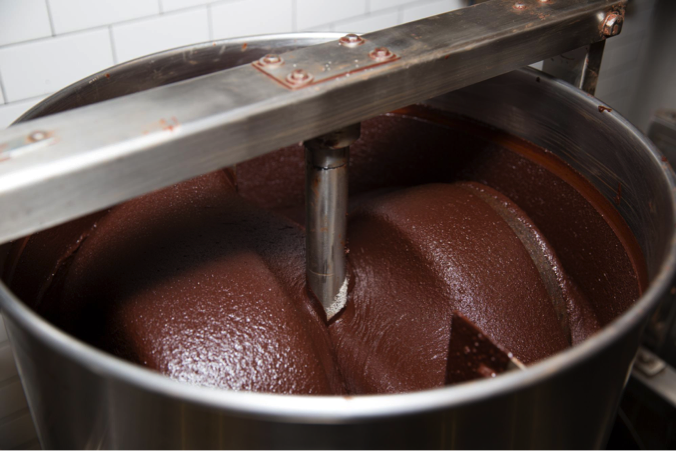 Each batch stays in the melanger for three to five days, until we know the chocolate is ready. But how do we know when it’s ready? 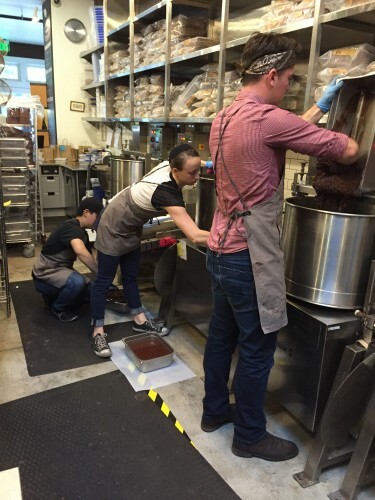 Deciding when to “pull a batch” is a matter of personal judgment, but we have a few benchmarks and tools to help us. First, we taste. Is it well-balanced? Delicious? Smooth? Exactly as it should be? 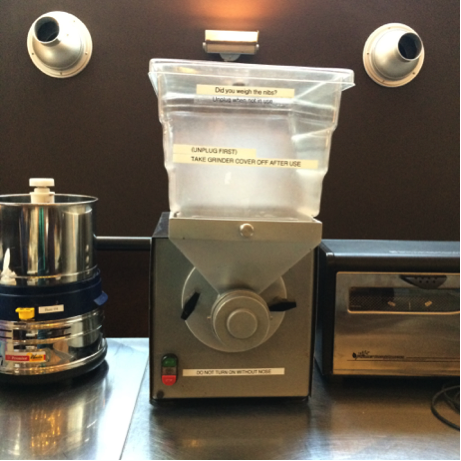 If we taste grit—which indicates the particle size is still too large and needs more time under the granite wheels—we know it’s not ready. 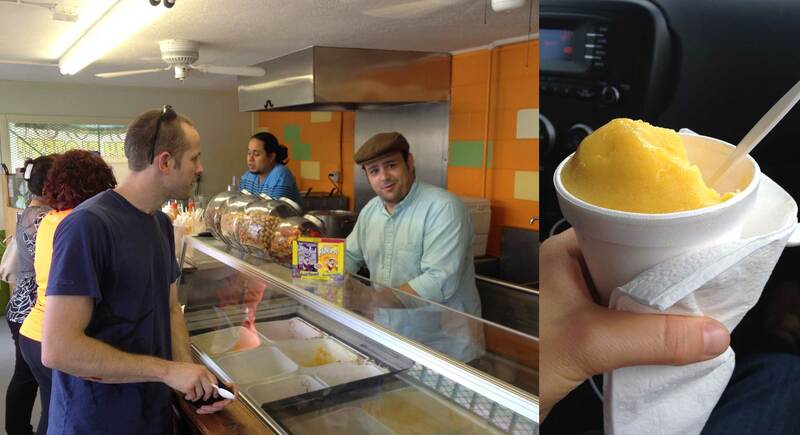 If the texture is smooth but there are a few off flavors, it needs more time to conch and mellow out. If the texture and flavor are flat, it means it may have been in the melanger too long and refined to a particle size that’s too small. We prefer a particle size between 20 and 30 microns, which makes for a smooth mouthfeel but isn’t too small to keep the flavor from dancing around* in your mouth. To help us understand what we’re tasting, we used to use something called a micrometer, which measured particle size by pinching a small sample of chocolate. This was a good tool, but it was limited to measuring only the largest particle in any given sample. Even if we measure three times, that’s only three particles. Enter the grindometer. 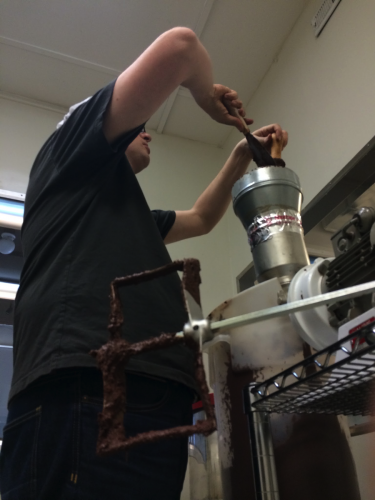 We learned about grindometers at last year’s Chocolate Maker Unconference, and later decided to purchase a particular model that we learned about from the guys at Hexx Chocolate in Las Vegas. A grindometer is a beautifully simple instrument used to measure particle size in suspensions, usually printing inks and paints. The instrument itself is a stainless steel brick with two almost imperceptibly shallow channels carved across the length of it. The grooves graduate from a depth of 100 micrometers below the surface to 0 micrometers (where it’s flush with the surface). 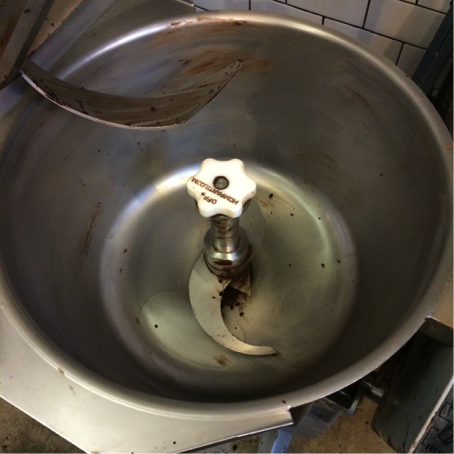 To use it, we drop two small blobs of chocolate onto the top of either channel, and scrape them to the end with a straight steel scraper. 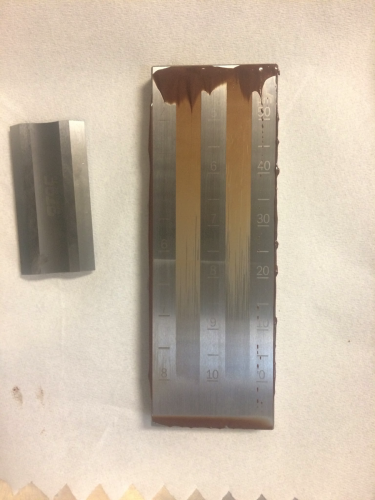 The particles slip under the scraper as the space between the scraper and the steel brick grows smaller, which means we get to see the entire distribution of particle size throughout a single sample of chocolate. Where the shade of the chocolate’s color changes most abruptly, from dark to lighter, indicates the size of the majority of the particles. 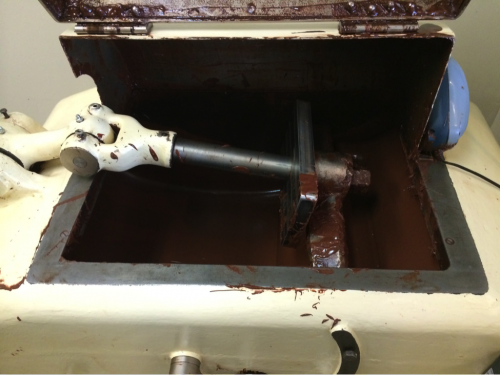 When that drop-off happens between 20 and 30 microns, we know the chocolate is somewhere close to its sweet spot, and could be ready to pull. To see it in action, stop by the factory! 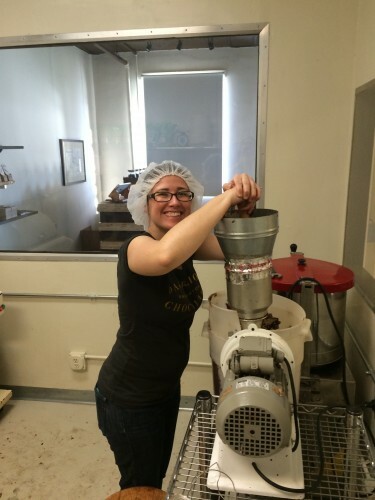 As a small, bean-to-bar chocolate maker, we’re part of a very small industry. 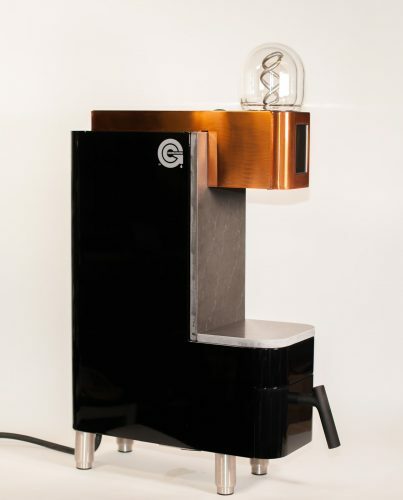 Since the beginning, that means we’ve had to build a lot of the machines that we couldn’t find, as well as engineer creative ways of meeting our small batch needs. 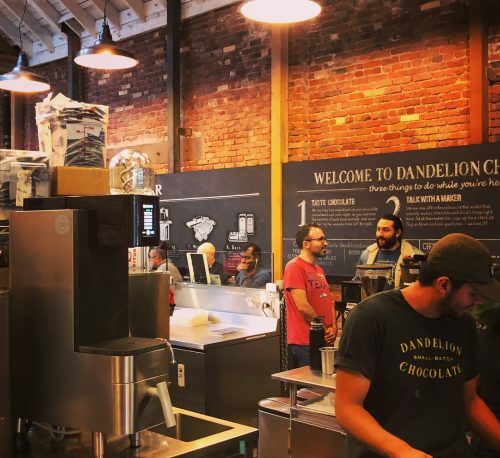 When Todd and Cam moved from a small garage into a small factory in the Dogpatch, and when we later expanded into our current factory on Valencia Street, a good deal of that machinery came with us. 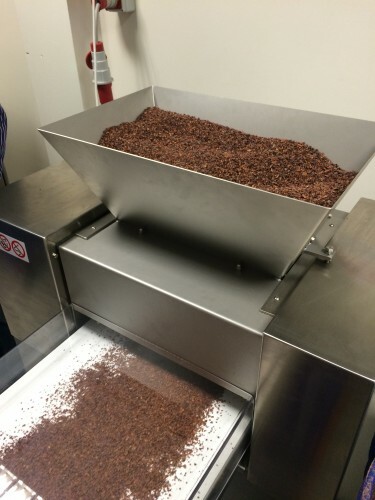 Our PVC-and-vacuum winnower, the vibrating wooden sorter, our bean cracker, and more. As the months roll by, we’ve slowly upgraded when we’ve found better ways of doing things or when the machines were past their prime. Still, if you’ve been through the factory in the last year, you’ll likely have seen some relics chugging away, paying their dues. Last week, we bid adieu to our oldest piece of still-working equipment: the Crankenstein. 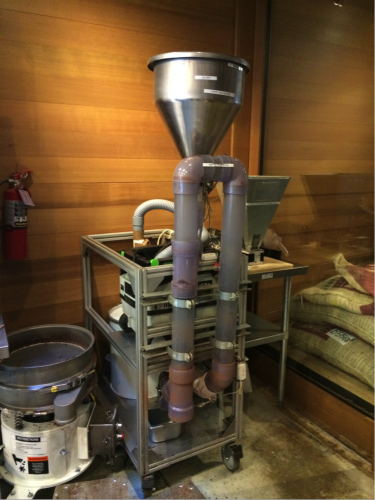 Crankenstein was our devoted bean cracker, a set of three rollers that we installed in a table under a hopper. 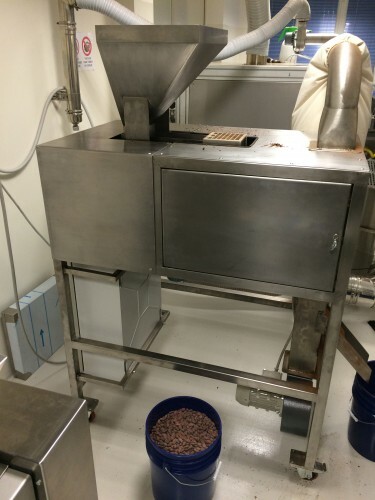 This is where we cracked beans after roasting and before winnowing. Generally, it did well, but it was slow enough to bottleneck our whole process, and we must have spent weeks of our lives standing over it, scraping jammed beans out of the rollers with the end of a ladle. We needed something better. Mufu approves of the Bean Dervish. 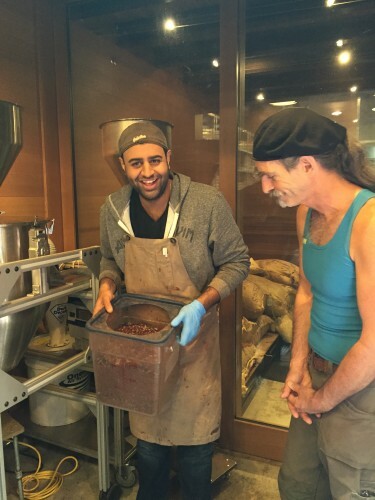 Last year, Mike Orlando, owner of Twenty-Four Blackbirds out of Santa Barbara and creator of some amazing chocolate, showed us a different approach to breaking beans. Working with Mike’s device as the inspiration, our Magic Man of Machines—Snooky Robins—has been putting together a very different kind of cracker. It’s tall, it’s shiny, and it’s called the Bean Dervish. 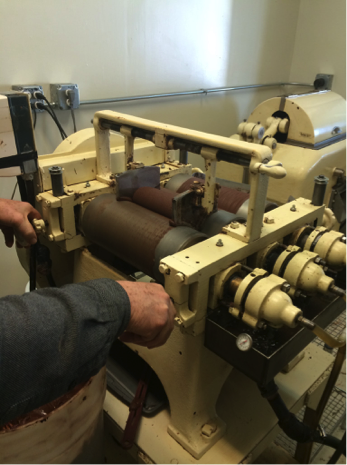 The machine works much in the same way as a walnut cracker from the 1880s. It works by flinging beans against the sides of a big steel drum, breaking them on impact. The Crankenstein relied on friction to pull beans in between a fixed sized slot, this had numerous problems including reduced speed through wear on the roller, small beans not breaking, and large beans getting stuck. As the Dervish doesn’t rely on friction or a fixed sized slot to break, it works incredibly well and breaks beans (of any size) consistently. The point of a cracker is to break the beans into sizable chunks that make it easier to winnow the husk from the nib. Due to its force and speed, the Dervish also breaks nibs away from the husk more effectively, which means our yields are improving too. Oh, and compared to the Crankenstein, the Bean Dervish moves at the speed of light. 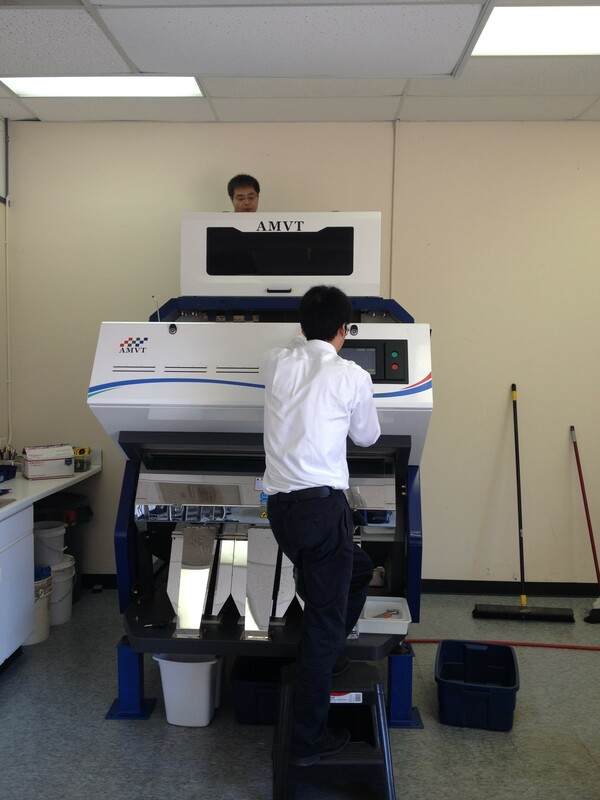 Come by during production hours to see it in action! If you think this sounds like a good way to break your beans, Mike is working on building these sort of Breakers and can be contacted at mike@twentyfourblackbirds.com. 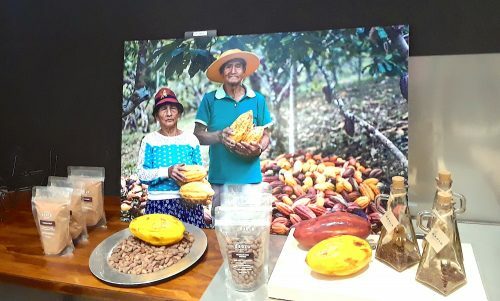 Several weeks ago, I gave a tour to a group of chocolate enthusiasts. 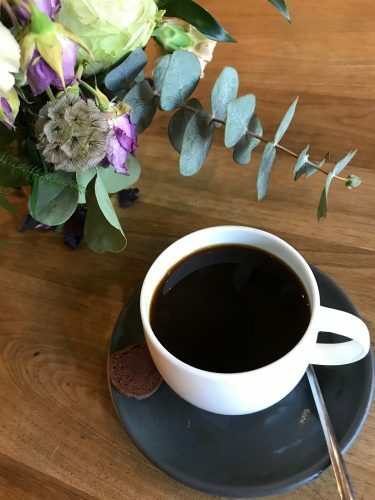 Our conversation quickly progressed from a general beginners’ overview to an in-depth discussion of our farmers’ fermentation process, terroir, genetics, Dandelion’s roast profiles, and tempering. 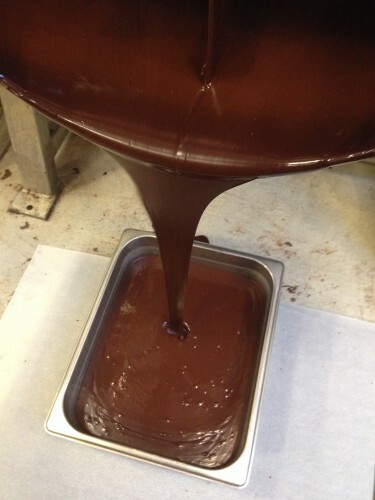 Tempering is a process in which we raise and lower the temperature of chocolate to allow crystals to form. Certain crystals form a structure that results in a shelf stable chocolate with a shiny sheen, nice snap, and smooth texture. Crystals in this stage are known as Form V crystals, and they provide the foundation for well-tempered chocolate bars. I looked at her blankly because I didn’t know the answer, and I wasn’t entirely sure what she was asking. Did she want me to draw the crystal structure showing the carbon bonds that symbolize chocolate? Was she asking what kind of crystals are required? Her question and my inability to answer it at the time prompted me to do some digging. The following is what I have interpreted from various textbooks (yes, textbooks!) on chocolate. 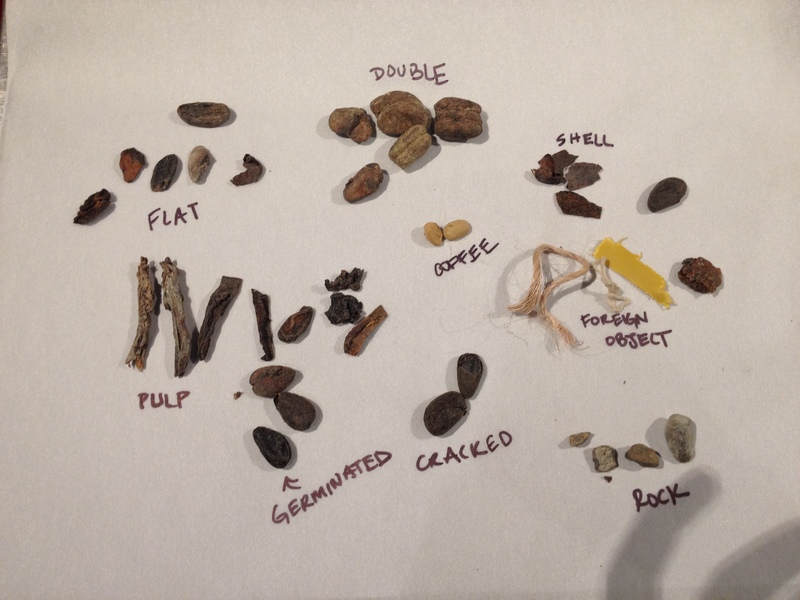 The first step to understanding tempering is to understand the cocoa bean. 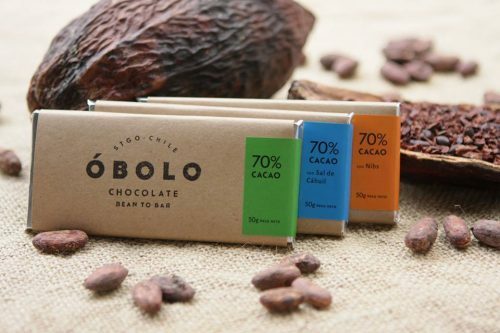 Cocoa beans are made up of about 50% cocoa butter and 50% cocoa solids. Cocoa butter is a natural fat present in cocoa beans, and is integral to tempering due to its ability to crystallize, or to form crystals, at different temperatures. The crystalline structure of cocoa butter is what determines the appearance and texture of chocolate. Cocoa butter crystals can pack themselves (molecularly) into six forms. Each crystalline form has a different melting point and the higher the form, the higher the melting point. In other words, Form I has a crystalline structure with the lowest melting point (16°-18° C) while Form VI’s structure has the highest (34°-36° C). The various crystalline structures make chocolate appear different to the casual observer. 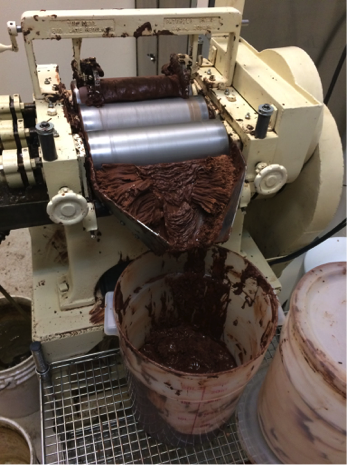 While our chocolate bars are tempered into Form V, other unstable crystalline forms can be found throughout Dandelion’s chocolate making process. These unstable forms usually result in an uneven appearance–light brown spots or pale surface swirls on the chocolate, for example. These spots and streaks are known as bloom, and they appear due to a natural separation of unstable cocoa butter crystals from cocoa solids. Untempered, bloomed chocolate breaks apart easily, but is still edible and tasty. 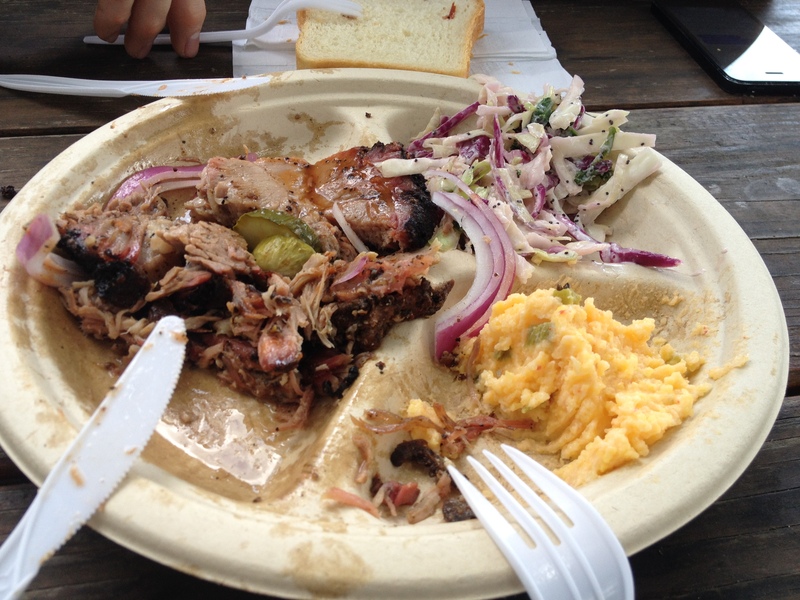 In fact, we eat it all the time for quality control. 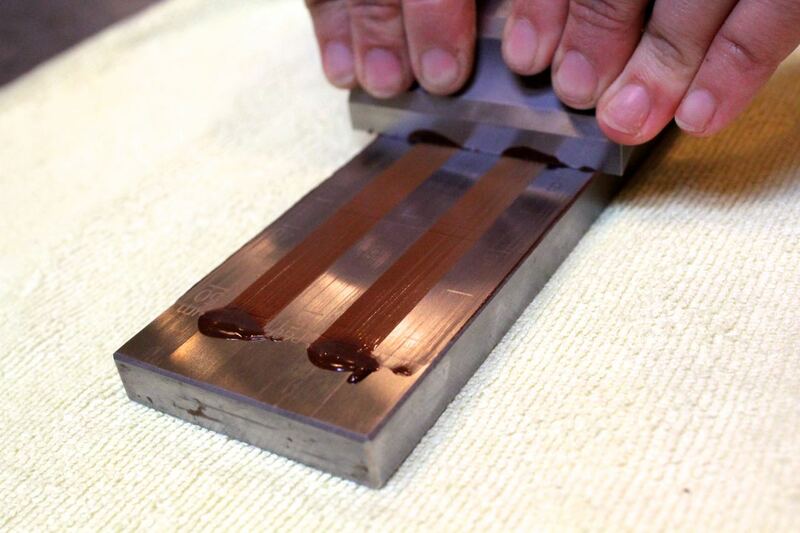 So, why do we temper chocolate? Bloomed chocolate is easier to break apart (sort of). The most important reason is to keep chocolate shelf stable. Form V chocolate contains the most stable cocoa butter crystals due to the fact that they won’t melt until 85°F/29°C – which is well above external body temperature. This crystalline structure allows our chocolate bars to retain their glossy sheen and shape when they are stored in a cool, dry place. 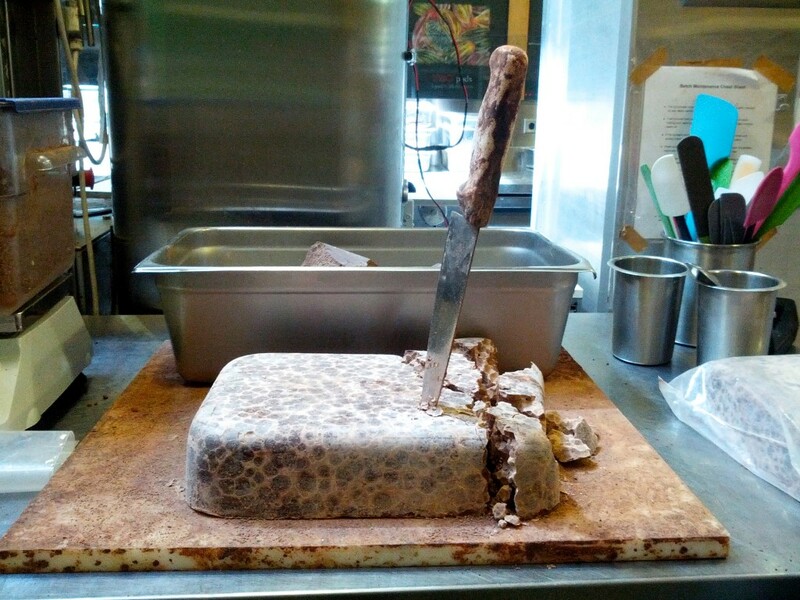 Dandelion Chocolate’s bars can usually be kept in this condition for up to a year. 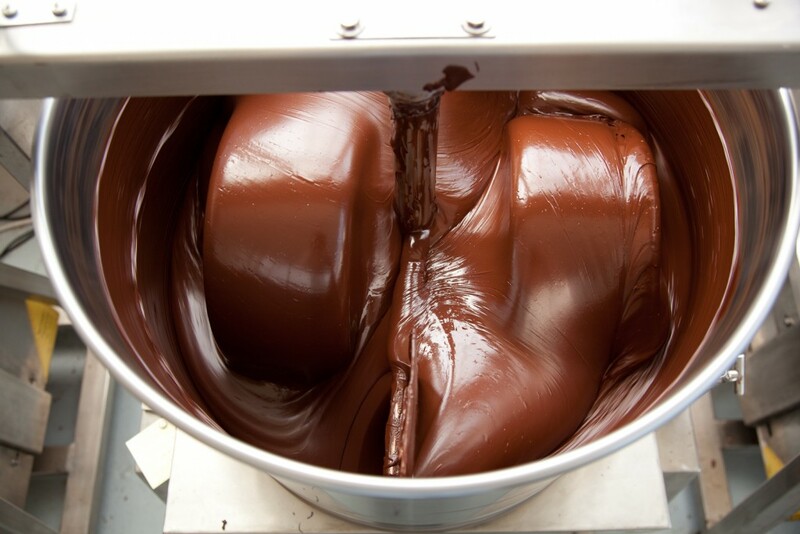 Shelf stability is also the reason why many chocolatiers temper chocolate for their bon-bons and truffles. 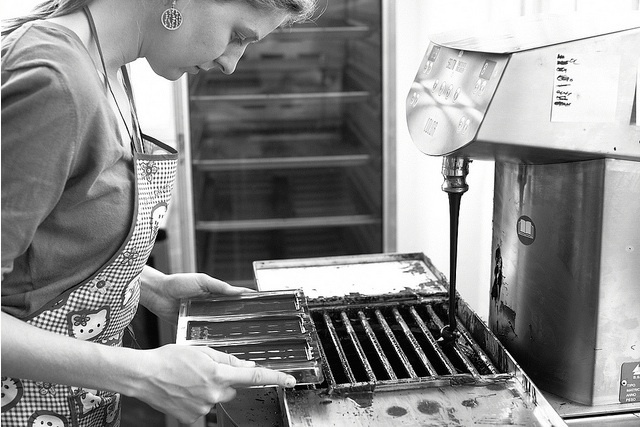 At Dandelion, we use a continuous tempering machine designed and built by FBM Boscolo, the Unica. 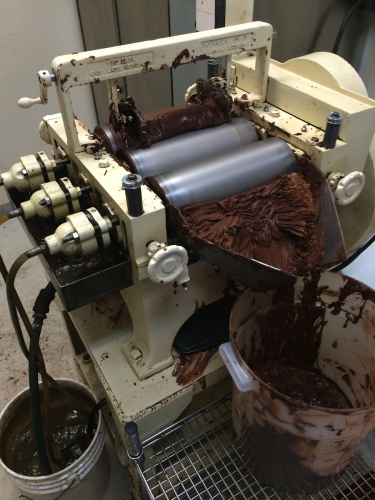 This machine allows us to control the temperature of the chocolate in three different steps – but we only use two. 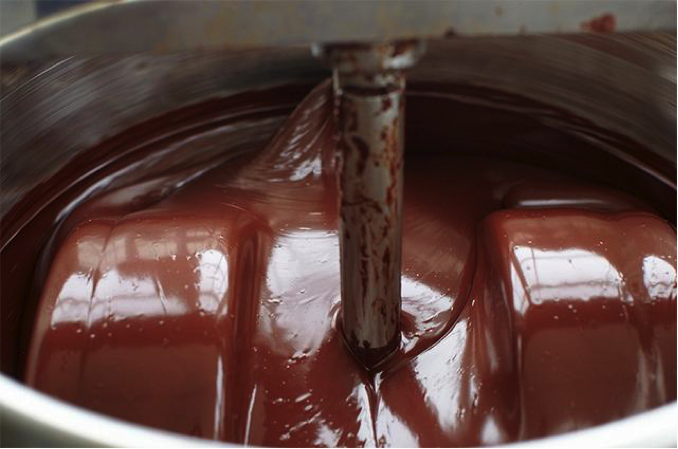 First, we raise the temperature of the chocolate to 50°-54° C in order to melt away any crystals that may have formed. Then, we lower the temperature and agitate the chocolate to encourage the development of a Form V crystalline structure. 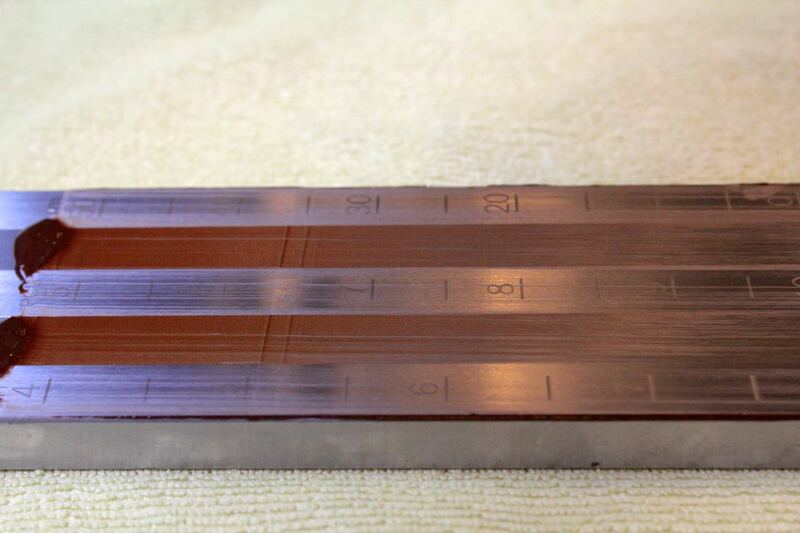 Done correctly and with some time, Form V chocolate will contract from our mold as it cools, leaving us with a beautiful, shiny, dark chocolate bar. 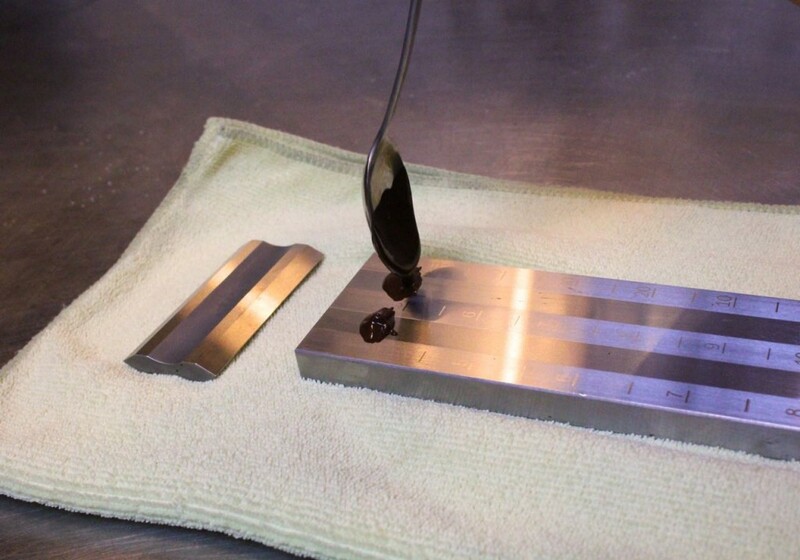 Stay tuned: In the next post, I will write about other factors that affect the tempering process. Minifie, Bernard W. Chocolate, Cocoa, and Confectionery: Science and Technology. 3rd ed. Gaithersburg, Maryland. 1999. Print. 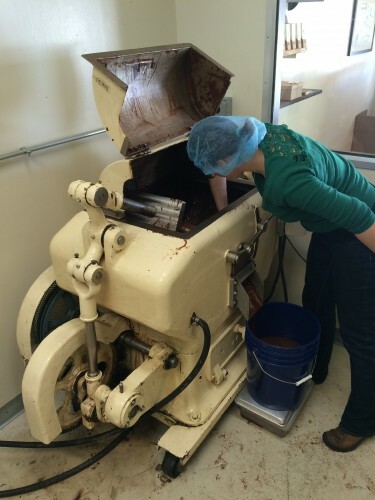 Join us for The Chocolate Maker Unconference! I love chocolate, and I have for as long as I can remember. But, when I became a chocolate sourcerer, I learned something surprising. 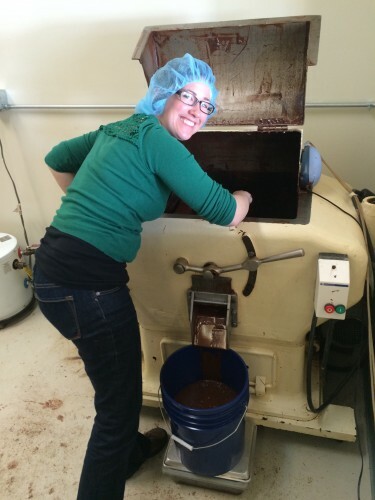 While I enjoy making a product I love, what I really enjoy most is meeting other chocolate makers. There is nothing better than engaging with others who share your passion. 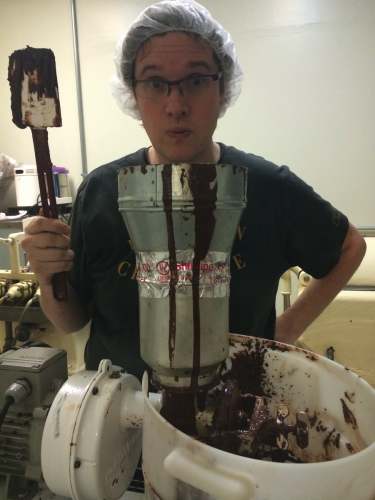 This is why I’m excited to be involved in the upcoming Chocolate Maker Unconference in Seattle on October 2-3, 2014 (happening prior to the annual Northwest Chocolate Festival). 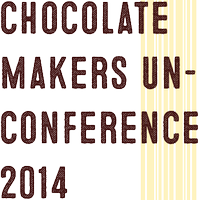 The 2014 Chocolate Makers UnConference provides space and time for professional Chocolate Makers to engage with others in their industry to talk about the topics that are important and relevant to them. The conference is 2 days to allow time for each attendee to engage and work through multiple topics. The conference does not feature talks or lectures but rather an “open space” format that focuses on inclusive engagement with round-table style sessions and open dialogue to accomplish what the group determines to be their goals. 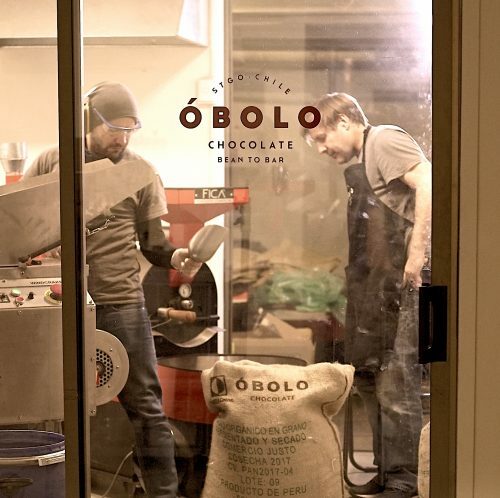 Topics may range from: the best way for new chocolate makers to get small quantities of quality beans; working through a design for a new winnower; putting together an agreement for more effective direct trade; designing a tasting structure that fits the craft chocolate tasting goals. If you have any questions for me about this, feel free to contact me at beans@dandelionchocolate.com. We wanted to make it free but we needed somewhere to meet so the fee of $100 is designed to cover the cost of the space. 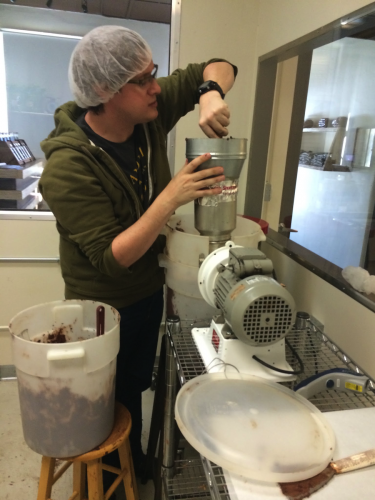 I encourage anyone in the chocolate making industry (makers, growers, equipment producers, etc) or even those getting started in the chocolate making industry, to join us. We’d love to meet you! 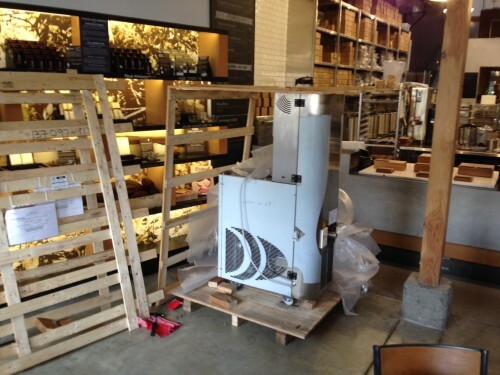 We’re still unpacking it, but our new tempering machine from FBM just showed up. It has a few features that should allow us to be a bit more efficient. With the holidays quickly approaching, the timing couldn’t be better!